A big part of successful Account-based Marketing (ABM) is monitoring and responding to the activity of contacts at your named accounts. If you sell into an enterprise space and are going to the effort of personalising your marketing toward specific, named accounts, its important that your sales team know what actions people at those accounts are taking, and when. 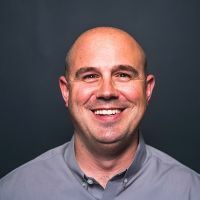 HubSpot's CRM, workflows and internal notifications are the perfect tool set for automating the monitoring of named accounts and alerting the appropriate sales people to their actions. 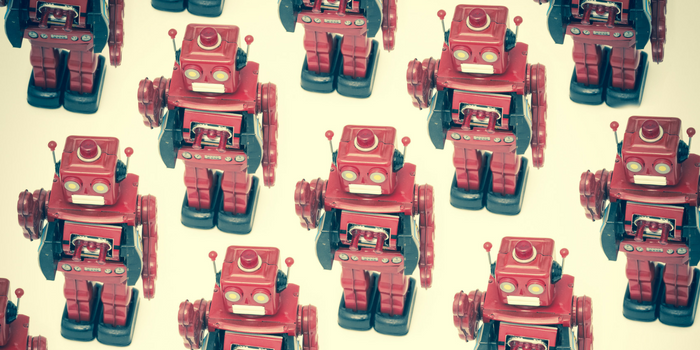 Here are 5 ways you can get your HubSpot CRM and/or inbound automation platform ready to take your ABM to the next level. When embarking on your ABM strategy, you need a way of identifying named accounts within your database of companies. The easiest way to do this in HubSpot is to create a custom company property. A simple approach is to create a checkbox property called 'Named Account' or similar, and mark it as Yes or checked on already identified target accounts. If you are implementing a tiered AMB approach, then a dropdown property with values like Tier 1, 2 and 3 would be a good alternative, enabling you to identify and classify named accounts with one property. When running ABM campaigns, you will want to notify sales people when their accounts engage with your content or website, so that they can enrich the data they have and respond accordingly. Doing so requires that named accounts are assigned the right owner in HubSpot before you start reporting on their behaviour. A rule set and workflow(s) are needed to ensure that this happens. Whatever your account assignment process, a HubSpot workflow can probably automate it using either if/then branches or lead rotation rules. Because HubSpot's automation is driven more by individual contacts than it is by companies, it can be very helpful to turn on HubSpot's setting to synchronise HubSpot owner across companies and contacts. Doing this makes sure that the account owner gets notifications for any and all contacts at an account and no one slips through the cracks. Read more about syncing account and contact owner here: How can I sync ownership between contacts and companies? 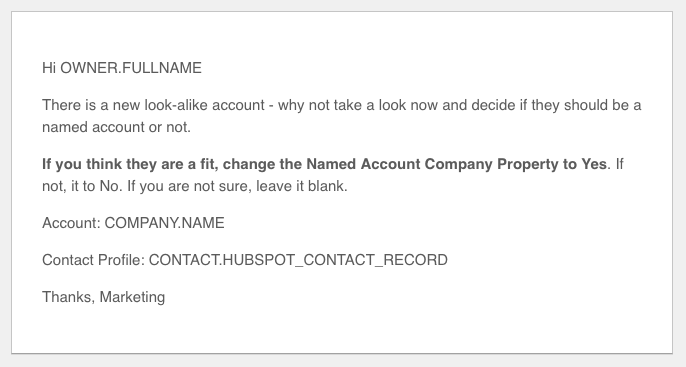 If a new contact at a named account converts on your website and appears in your CRM, you're doing something right. When this happens, its time to notify the account owner immediately and have them review the contact, determine the position they hold and if they are in the decision making unit (DMU). In HubSpot, a workflow will watch for contacts, not companies, that meet the starting criteria. But it you make the starting condition check the value of the Named Account property on the associated company, each new contact at that named account can trigger the start of the workflow. This workflow should send an automated email to the account owner notifying them of the new contact and asking them to enrich and qualify the record as soon as possible. In addition to account owners using external sources, like LinkedIn, to identify job title, this process could be enhanced with the creation of custom contact property to denote membership in the DMU. If using a DMU property, the following activity notification workflow could be constrained DMU contacts only, optimising efficiency for the sales team. 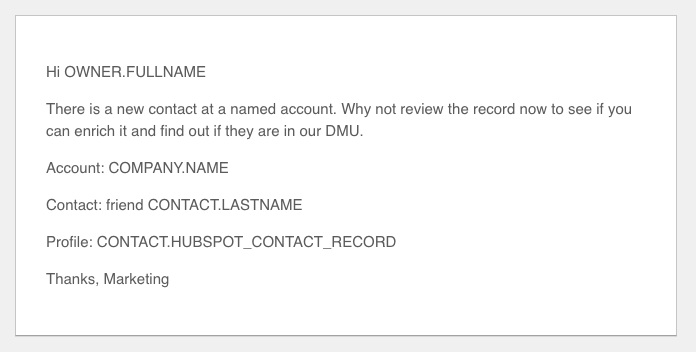 When known contacts at named accounts come back to your website, account owners need to know about it. If the number of named accounts and associated contacts is small, you could let HubSpot's standard lead revisit notifications perform this role. If, however, you want to provide more information to the account owner, you should create one or more HubSpot workflows that look out for certain behaviours - such as specific web page views or form submissions - and send customised notifications putting additional data right in their inbox. While your named account list is a great starting point for ABM, there could be lots of other companies out there that fit your ideal buyer profile. Configuring HubSpot to look out for these and to let you know when they are on your website can help you expand and scale your ABM activity while remaining totally focussed on the right kind of buyer. There are a number of ways you could do this but the approach I like uses a combination of lead scoring and internal notification workflows. Note: If your HubSpot lead scoring tool is currently occupied trying to identify MQLs, stop it and read this post on what an MQL really is. Start by loading the ideal firmographics of your ideal buyer into the lead scoring tool as positive attributes. Properties you can use for this include annual revenue, industry and country - all of which can be gathered automatically by HubSpot Insights. You can give these attributes whatever positive lead score you like. The ideal situation, however, is that a company has to meet all criteria to qualify as a candidate named account. This means you can assign equal scores to each attribute and work towards the same total in every case. Next, create a workflow that triggers whenever a contact (that is not already at a named account) reaches the target MQL score and sends an internal notification to the relevant sales people asking them to review, enrich and qualify the account. If the account meets your named account criteria, sales should set the Named Account property according, which will enrol that account, and all contacts at it, in to workflows we created above. These hacks don’t take into account any integration you may be running, and you might need to modify them to fit your unique ABM strategy and sales processes. Hopefully though, they serve as a useful starting point from which you can build out a sophisticated solution that is customised your needs.